The Denby cast iron griddle pan is superb for making delicious healthy meals with minimal effort and maximum wow-factor. 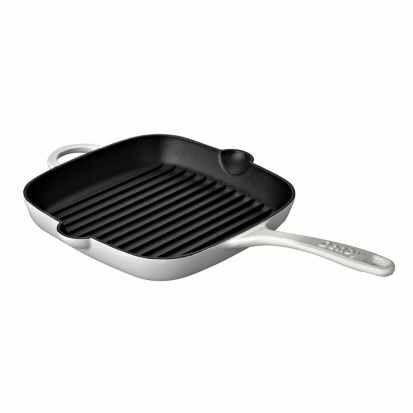 The pan has the distinctive sear lines that look professional and help to lock in flavour as well as minimising the fat content that is retained by the food. It can be used on any heat source, including induction, and it can even be put in the oven. The cast iron construction means it retains heat very well, which makes cooking energy efficient too. The easy-grip handle makes it a joy to use, and the tough enamel surface (inside and out) helps make cleaning up super-easy too.